Yesterday Honda debuted a video featuring the all-new sleep two-door Honda Civic Si Coupe and the stylish and spacious four-door Civic Si Sedan. Both cars go on sale next month. The designs are sporty and practical and cater to the everyday Honda Civic enthusiast. The standard Civic Sedan and Coupe perfected the sportish and stylish design. The Si models now sport an aggressive black “wing” front fascia, and larger side air intake features. The Si also feature 18-inch and 10-spoke alloy wheels with a two-tone finish exclusive to these models. The car wears 235mm-wide low profile tires, and a chrome center-mounted polygonal exhaust finisher. The rear of the models include larger side vent features, as well as a dark lid spoiler incorporating an LED brake light. The Si Coupe also adds a prominent raised spoiler to the standard Coupe’s already distinctive full-width light bar. The interior of the Civic Si has model exclusive bolstered front sport seats. The seats have red stitching in them, including stitched in Si logos, and the stitching carries through to the doors, steering wheel, and leather shift boot with an aluminum shift knob. The interior also has a red driver’s TFT meter with red system illumination. The interior of the Civic Si models also cater to the comfort and convenience of the owners. These new to the model features are building off the Touring Civic Sedan and Touring Civic Coupe models. These features include LED headlamps, wireless charging, electronic parking brake, walk away door locking, dual-zone automatic climate control, heated front sport cloth seats, heated rear seats (which is only available in the Si Sedan, not the Si Coupe), and rain-sensing wipers. What would a new car be without various technology compatibility inside? The Si Coupe and Sedan are no exceptions to the every growing connectivity within new Honda models. They feature 7-inch Display Audio Systems with Honda Satellite-Linked Navigation Systems that serve as the command center for audio, HVAC and other technological functions within the car. This Display Audio System features compatibility with Apple CarPlay and Android Auto platforms which creates seamless integration of smartphone features and functions. These functions include app-based navigation, streaming audio, voice controlled search capabilities and access to a host of Apple or Google approved smartphone apps. 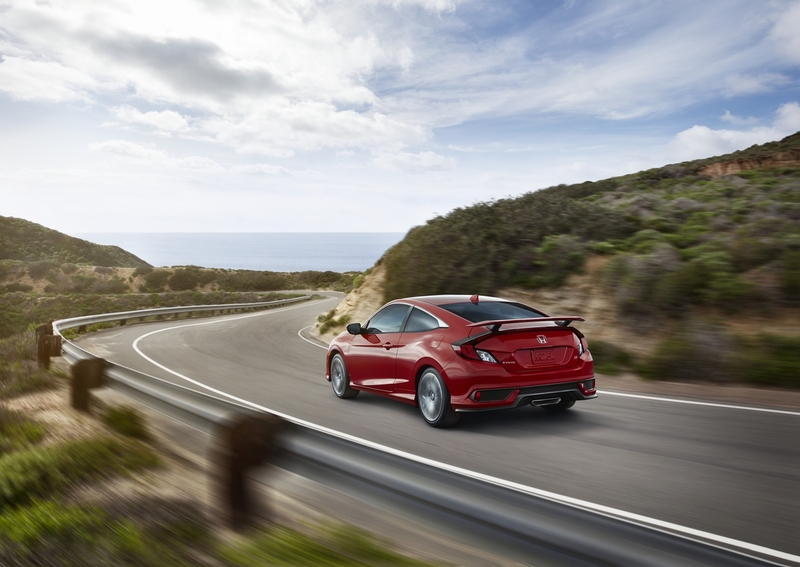 The all new Civic Si Coupe and Sedan go on sale next month. Keep an eye on Henley Honda, where you’ll be able to come check out these all new features for yourself once these cars hit our lot. Can’t wait that long? Check out the debut video below.